This is an unofficial page. This page is no way supported by Casio. I am not a Casio reseller, and i'm not planning to sell my watch. 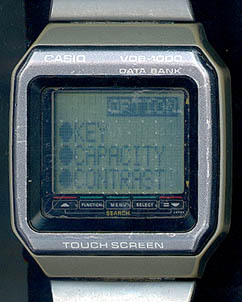 The Casio VDB-1000 is a very unique watch : it's a very early touch-screen PDA on your wrist! 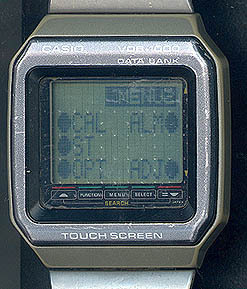 I first believed that this watch was the first ever touch-screen watch, but Casio was not the first on this playground actually : back in 1984, EPSON released the RC-20 which offered both a touch screen and a programmable mode. 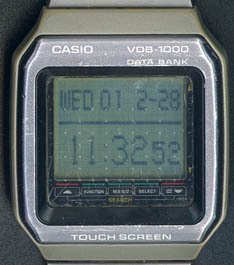 I've also heard about earlier touch screen models from Casio; like a VDB-100; which i have no details about, but sounds like a very similar product. 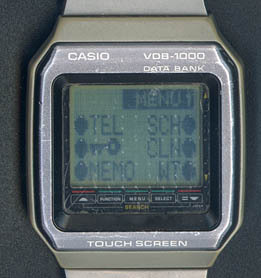 Today, however, even after Casio released newer touch screen watches, the VDB-1000 concept is still unique : it's the only Casio touch-screen watch with a full graphic display and very different application screens. The touch screen area covers the 3/4 of the screen, with an extra area below the display area for 5 sensitive function keys, namely : UP, FUNCTION, MENU, SELECT, DOWN. Apart from those function keys, the sensitive area on the screen offers 15 sensitive keys which are freely used by the different applications. Only the top display line has no sensitive mapping. Each application can be accessed by pressing the appropriate appname on the screen. Pressing MENU again opens the menu2 screen (below, left). Click the image to explore the Menu 1 applications. The other application are available from menu 2. The OPTION menu (on the right) is also accessed from this screen. This is the last menu screen, available from the Menu 2 screen. From this screen, the software settings can be set. Click on the image to view the setting screens.